Adopting powerful wireless chips, with extended power amplifier (PA) and low noise amplifier (LNA), can maximize the system output power while reducing the system noise factor, thereby improving the signal coverage. 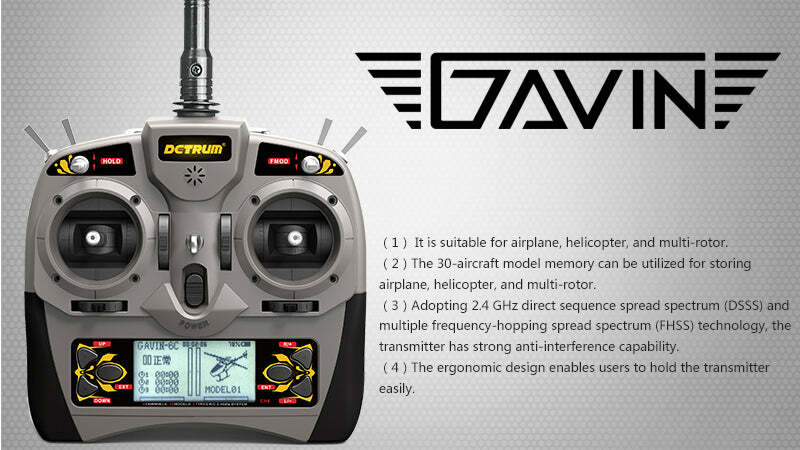 The transmitter uses excellent linear all-band gain antenna, can greatly improve the transmitting efficiency, thereby enhancing the stability of the R/C system. The receiver adopts a diversity antenna, can automatically switch the signals to ensure the stability of the received signal. It is suitable for airplanes, helicopters, multi-rotors and other aircraft. The R/C system adopts 2.4GHz direct sequence spread spectrum (DSSS) and multiple frequency-hopping (initiative to avoid co-channel interference) technologies, has high receiving sensitivity and strong anti-interference capability, can support a stable remote control for more than 1,000 meters on the ground and more than 1,600 meters in the air. Each transmitter has an individually assigned, unique ID code. Once the binding is made, the ID code is stored in the receiver and no further binding is necessary after restarting the receiver. When the receiver is working, it will verify whether the ID code of the transmitter is being paired, to enhance the stability of the R/C system. It has the fail safe function. 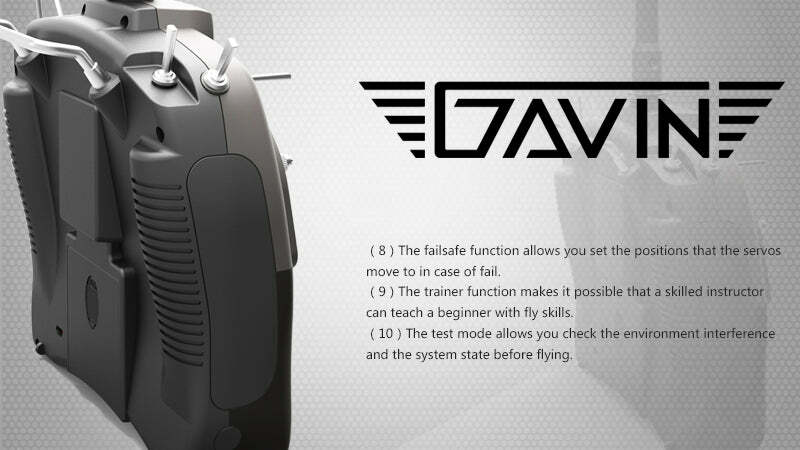 When the aircraft flies out of range (the receiver does not receive a valid RF signal from the transmitter), the receiver will output signals base on the fail safe setting from the transmitter. 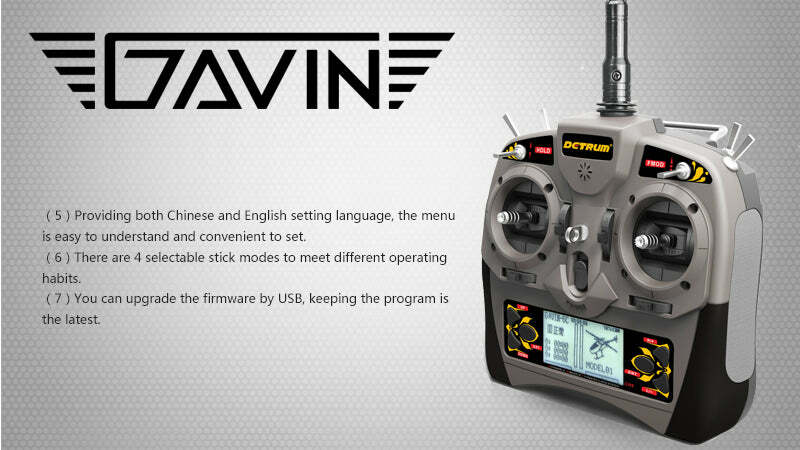 By using these high-resolution (4096-segment) sticks, you can experience a smooth and exquisite flight operation. Using low power devices and transmitting the signals at intervals, this will reduce the transmission power, also lead to low battery power consumption and longer battery life. Detecting the input voltage of the transmitter in real time, it will alarm in advance when it is low battery voltage. This will bring greater security for flight operation. Detrum Gavin radios are only compatible with Detrum brand receivers. Click the Spare Parts tab above to see a complete list of compatible receivers. I've only got 30 min of flight time, but I've got a couple of hours of set-up time on this radio. I've had no problems. It's not heavy and feels good. The Receiver binds quick and works good. The Gyro ..... I don't know, it has confounded me so far. The user manual is very good. My only negatives, are there is no charging jack, and the alarm could be LOUDER. Fantastic radio for the price. Used it for the first time in my ASW26 at very high altitude no problems took me a few hours to sort it out were my Taranis over a year. The only problem is that I had to mount the gyro receiver facing to the rear opposite to instructions to make the ailerons work in the correct direction. Other than that and a few other things highly recommend it. Bench tested the receiver and transmitter with all flight components and all worked well. Haven't yet flight tested both in and airplane but will soon. Good as more expensive brands. New techknowledgy is a good an an old brand name.